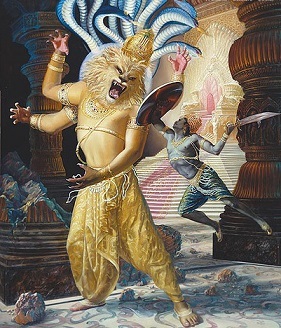 Who appeared as Lord Nrsimhadeva. O Nrsimhadeva ! I humbly bow down unto your magnificent form. O Nrsimhadeva ! I humbly bow down unto your magnificent power. Tore off his intestines and let out a mighty roar. O Nrsimhadeva ! I humbly bow down unto your magnificent feat. While Prahlada sang his choicest psalms. O Nrsimhadeva ! I humbly bow down unto this magnificent sight. Thou annihilated the demon and his terrifying impact. O Nrsimhadeva ! Annihilated the Hiranyakasipu in my heart and nurture the love of Krishna.